The post Win a $10k Mobile Developer Rig from Xamarin at Build 2015 appeared first on Xamarin Blog. The post Join Xamarin at Microsoft Ignite 2015 appeared first on Xamarin Blog. Applications and businesses live on data. Data is what makes a business a business, generates value for customers, and allows a company to generate income. Displaying data to a user is a common operation, especially in mobile. It might be immensely important for a salesperson to get the last bit of information before visiting a client or to display the location of a restaurant via a local consumer-oriented app. In this article, I’ll look at the UITableViewController class that allows you to get at and display that data in an iOS app. The post Crédito Agrícola Banks on Xamarin Platform, Test Cloud, and Insights appeared first on Xamarin Blog. FreeAgent have finally released their mobile app! It’s been a (very) long time coming, and giving the importance of mobile these days, I’m surprised it’s taken them this long. To be honest, while they admit its a v1.0, it’s a good looking, and well executed app. It fits with their branding, and covers the two main areas which people use mobileAgent – my FreeAgent app – for: expenses and invoices. From a quick spelink around the .IPA, they are using Cordova and React (and jQuery and a load of other stuff), which given their background in web, isn’t a surprise. To be honest, if I was writing (from scratch) a cross platform mobile app right right, I’d be seriously looking at React and ReactNative, especially if I had a load of web and JS people on staff. Using React and Cordova is a good stepping stone, especially (I expect) when they started this, ReactNative didn’t exist. There are a few bits which make it obvious that it’s a web app in a container tho – I can’t edge-swipe to get back from a list to the main screen (which I use all the time), and the NavBar scrolls off the top of the screen in funny ways from time to time. So where does this leave mobileAgent, my (aging, decreped but still quite functional) FreeAgent client? For the moment, in a simlar position to where it was before. mobileAgent was designed at the time when data was scarce and expensive (500mb data cap? LUXUARY! 3G? Only in the big cities! ), so it was (poorly) designed to work offline first and foremost. Want to do your expenses on the tube on the way home? No problem. Note that when I say poorly, ageing and decreped, it works fine for the user. I’m talking about the constraints I have to work in – the internal design of the app, the external design (functional, but now hugely inflexible), and other aspects which make it less than fun for me to work on. I started the app in mid 2010. I’d started using FreeAgent to manage my business in the Uk, and I loved it. I still do to be honest. But I also had an iPhone (3G!) and Novell – now Xamarin – had just released the early betas of MonoTouch – now Xamarin.iOS. So like any nail looking for a hammer, I wrote a client for it. v1.0 was released in October 2010. That first version only did timeslips, I think, and maybe a few other bits, but since then I added expenses, bills, invoices, timeslips, mileage, contact import and editing, project editing, bank info… its a long list of duct tape and spit. 6630 downloads, nearly 5 years, and 35 releases later, and it’s at v3.5, which is likely to be the last. Why? Well, obviously FreeAgent releasing their own is a big one, but Apple recently required app updates to include a 64 bit variant, and I have to do a LOAD of work to get the app to that point, work which isn’t worth it from a time vrs money point of view. To be honest, the whole thing hasn’t been worth it on a time vrs money point of view, but it’s been fun enough, and I’ve learned a lot, so I’m not unhappy about it. At a guess, I’ve sunk about £30-50,000 of development time (hours * my daily rate at the time), and about £200 of actual cash (the icon). 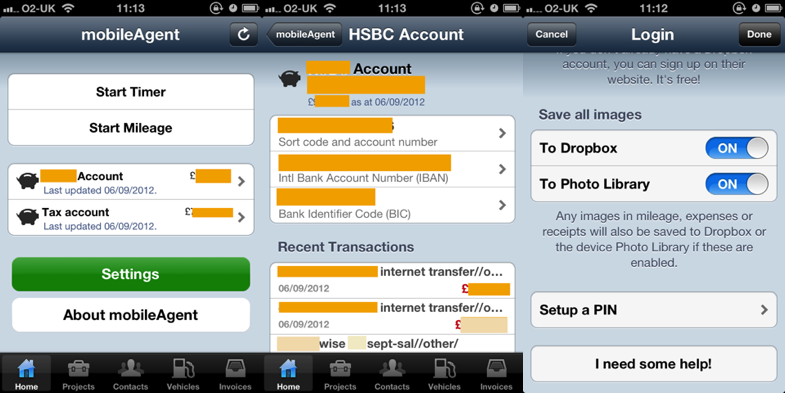 The app has made around £13,500 over that time, with a peak month (Feb 2013) of £536. It’s paid for a few phones, and a few other bits, but mostly it’s been a learning experience and a justification, if I needed it, to HMRC/IRD that I need to spend company money on “toys”. That alone made it worth it. So whats next for mobileAgent? Nothing, really. Or rather, no change. It costs me nothing more to keep it in the store, and it is still useful to people as it does, and shows, some things which the FreeAgent one doesn’t – bank info, mileage, timeslips, bills, etc. I might drop the price down a bit, but there again, I don’t think thats a blocker for anyone. I believe that FreeAgent needs to own the mobile part of their app. It’s a critical channel these days, and something they need to own and apply their own style and skill to. Their new app is a great step in that direction. So things are looking up for FreeAgent users, I think. The post Xamarin Dev Days is Coming to Your Town appeared first on Xamarin Blog.